Vocal Variety may be the easiest way to judge a public speaker – and the hardest skill to develop well. It’s all too easy to get overly dramatic with voices. We end up sounding like cartoon characters. Creating subtle characters using our voices demonstrates mastery of public speaking, which is why we have to struggle to work for it. Mona Lisa stands as possibly the greatest piece of art ever created by man. The portrait is known throughout the world, seen by millions every year. But the question is never settled – is she smiling? When we don’t use good vocal variety in our speeches, we leave our audience with questions about our emotions and what we expect them to do after our speeches. Leonardo may have wanted to be obscure – we don’t! a deep voice. We need to understand that these values exist on a continuum – we don’t just have either loud or low or fast. When we speak, we have a blend of the different values. That blend changes with almost every sentence we speak. Instead of thinking of speech values as an either/or option, it’s smarter to think of them like a color wheel. The shades create interest and convey emotion. In the end, vocal variety helps the audience to understand the need for the action the speaker is calling them to take. Like the Mona Lisa, there are techniques we can develop to create masterpieces with our medium – our voices. Learning to master our voices starts with understanding character. Our task as communicators is to understand the nature of the material we are to convey and find the most effective way to make our audience understand it. Relating this material to things that the audience already knows and understands speeds that process. By using evocative imagery, expressive body language, and emotional vocal variety, master communicators have learned from storytellers some techniques that work. We may have a dry technical report to give, full of facts leading to an unpleasant conclusion. But by using vocal variety, this kind of speech doesn’t have to be a dreary recitation of numbers and bad news. It can be inspirational, it can be fun. It requires creativity, preparation, and vocal variety. Identify when breathing becomes difficult and insert cues to yourself to breathe. Many Toastmasters find they’re asked to fill these roles when they’ve first joined their clubs. These are ideal roles to start with because they require the new Toastmaster to pay attention to timing and to how people speak. Recognizing the limitations of time is a critical skill as a speaker. Learning to listen and constructively find ways to help others improve will move a new Toastmaster along quicker than just speaking. 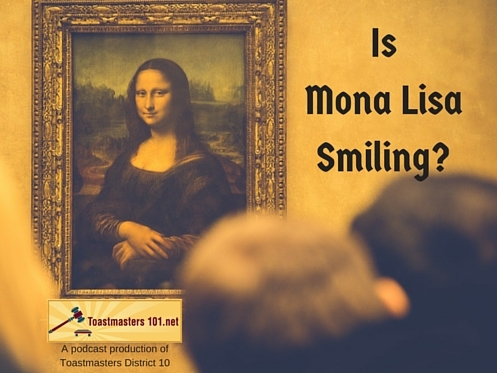 Like being an evaluator, paying close attention to other people drills the lessons down deep into the new Toastmasters before they’re even aware of learning the lesson.